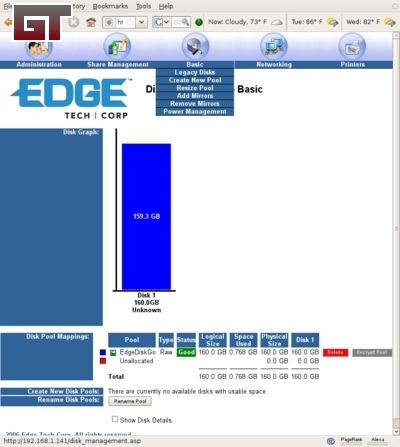 Installation for the EDGE DiskGO 160GB Networked Hard Drive is a breeze. 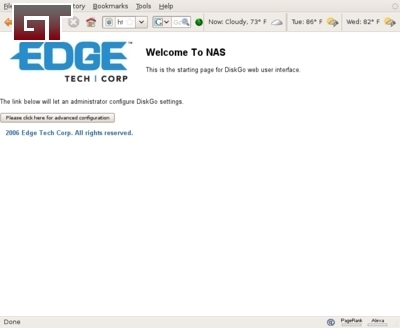 The only requirements that you will need is to have a switch that's connected to a router (or router with a built in switch) with DHCP enabled.�The reason for this is that the DiskGO needs to grab an available IP to start it's network shares. 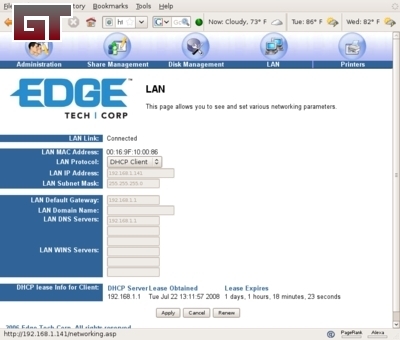 If you do not wish to use DHCP, you can turn this off after setting a static IP within the DiskGO's web browser based control panel. For my installation, this will be plugged into a Netgear 10/100/1000 four port switch that is connected to a Linksys WRT54G v2 with HyperThibor firmware. I have DHCP enabled by default as well as static DHCP for other purposes. To test the drive, I set up a Dell Latitude laptop running Windows XP Pro as well as an AMD Opteron 165 running Ubuntu Hardy Heron 8.04. Even though the box states that support is available only for Windows and Mac, it should not be an issue getting shares to show up through Samba on Ubuntu. 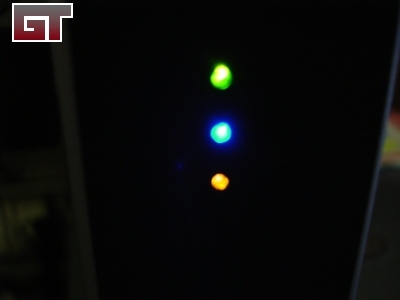 Upon plugging in the power and the Cat5 to my switch, the DiskGO powered up and after 30 seconds acquired an IP according to the blue LED being lit on the front. 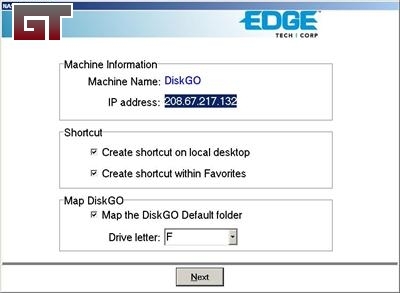 For Windows and Mac users, EDGE has included a CD with a more detailed instruction manual and�what they call the DiskGO Finder application. 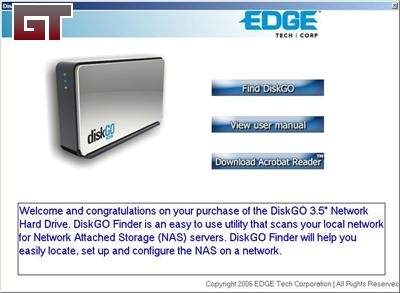 Essentially this application will go out on your network and search for a DiskGO drive that is connected. On my laptop, I found the application to not work all that well in finding the drive. I use OpenDNS for name resolution work and it picked up their IP as the IP for my DiskGO. Not very useful especially when there's no cancel button once it finds it so you can't back up. Although the finder failed in finding the right IP, I was still able to get to the drive by following the instructions. I just needed to type in 'diskgo' in Windows Explorer to get to the drive. Working wirelessly with the network share was nice and quick. After un-mapping the false drive that the application found I went directly to the router to find what IP the DiskGO had grabbed. With the IP and just entered it into Firefox and it loaded up the administration panel. The first section allows you to edit Basic information like your username and password. It also has an area where you can enter in NTP servers to sync up the time on the DiskGO. You can also upgrade the firmware, set up email alerts, change Windows Workgroup settings, and edit users. If you are on Windows Vista, you will need to upgrade to the newest firmware which supports Vista. You can grab it on EDGE's website here. You will also find the Vista version of the DiskGO Finder app. The next section is the Share Management. This lets you create share points on the drive. The third section is the Disk Management area. This is where you can see how much space is used as well as setup RAID 0 and RAID 1 drives. It also has the ability to setup JBOD (Just a Bunch Of Disks) to add extra storage. To do this you'll need to plug in extra drives in the USB port on the back of the DiskGO. The fourth section is the LAN option. This is where you enter in a static IP if you do not wish to use DHCP. The last section is probably one of the nicer extras you can get in a networked drive. The fifth area allows you to set up a networked printer. Using the IP of the DiskGO, you can send your prints to a connected printer on one of the USB ports. This is very convenient in that you now do not need to have a dedicated computer to be on to be able to get network prints. After poking around the admin panel, I went back to my Ubuntu rig to see if it would pick up the DiskGO. All I had to do was type in 'smb://diskgo' in the Nautilus file manager and up popped the drive. I created another share with the name 'Backup' which I plan to use for backups (obviously). Ubuntu creates quick shortcuts for you automatically for every drive you have access right on the desktop. 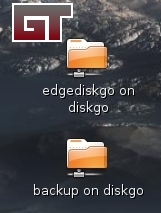 The 'edgediskgo' is the default share that came with the drive. Before I was able to use the backup, I needed to mount my samba share. I just issued the 'smbmount' command to get the share to show up as a mount point. 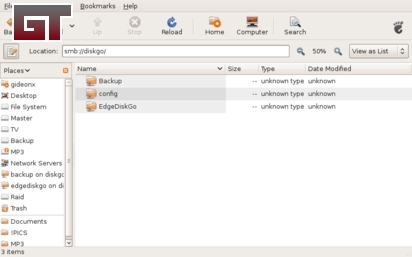 I used the 'Simple Backup' package�which is available in the Ubuntu repos. It's an easy to use incremental backup app which supports restroring as well. With initital testing of moving about a 1GB of data across the network, transfer speeds came in at at about 4.3MB/s which is only about 35Mb/s. It's not blazing fast, but decent enough for basic file transfers. I thought maybe it was because of the Netgear Gigabit switch, but plugging it directly into the Linksys WRT54G did not do much better. Maybe EDGE can release a unit with a Gigabit connection in the future. Overall, the ease of installation and use makes the DiskGO a viable option for the home or for the small office. With the ability to increase capacity, this unit has room to grow. The extra features in the admin panel will make any network administrator happy as well. The DiskGO network hard drive comes in various sizes up to 750GB to suit your needs. Update: Some questions were asked by one of our readers on our forums. Noise level of the drive is very low with only a slight noise while the drive spins up during power up and data access. The brand of the drive is not known since that would involve breaking the case open. I did not wish to do that (at least not now). The unit doesn't give off much heat. The outer casing is just slightly warm to the touch. The application is not needed to operate the drive. The disk format is CIFS. The USB ports are there to expand the drive. Thanks to EDGE for sending over this sample!